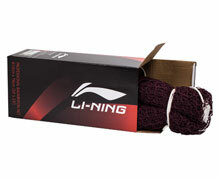 Li-Ning badminton nets are designed and manufactured to be performance-ready out of the box. They meet all regulations, specifications and standards as outlined by the Badminton World Federation that governs international competition. While Li-Ning badminton nets are quality crafted to endure the rigours of professional indoor use, they serve the needs of leisure, recreational, competitive and even international level players indoor or out because they can be adapted to most any net post or pole systems. 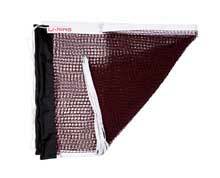 Whether this is your first net or a replacement net, understand that it is durable, portable and reliable. Made of 12-ply nylon, the recommended ruggedness for badminton netting, the mesh features a precision knotless material intended to outlast its polyester and vinyl competitors. 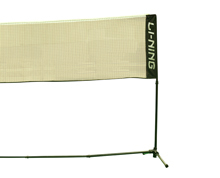 Stretching a standard 20 feet wide and 2.5 feet high, Li-Ning offers badminton nets that each feature a nylon top cable with a 1.5-inch white tape. 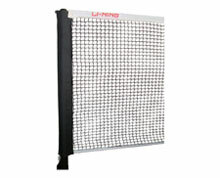 Li-Ning badminton nets include the LN1800 Professional badminton net, recommended for club or leisure use, and the LN2300 Premium badminton net, suggested for professional competition. Both nets can be purchased at your local dealer directly online. Badminton net poles are not included but can be purchased seperately. The top cord in all Li-Ning badminton nets is heavy duty enough to adjust to your badminton nets and posts or pole system, pulling tightly to a regulation 5-foot height for competitive play. 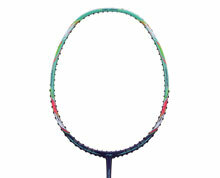 Side strings can then be tied to make the net even with the sidelines so you are ready for singles or doubles matches. Li-Ning badminton nets are made of dark artificial fibers for better visibility and they have a consistent, even thickness that helps sustain wear and weathering. If you are looking for portable badminton sets be sure to check our great assortment of products under the packages heading in the top menu. Li-Ning is a trusted global sports brand that has made the process of shopping for a badminton net and portable badminton post system easy and dependable. When picking up a badminton net or badminton post, you should check for some basic criterion such as durability and strength, the same characteristics that have driven Li-Ning to outfit athletes who have gone on to become recognized as world champions and elite competitors. Li-Ning badminton nets are competitively priced and backed by a 100% Satisfaction Guarantee and can be purchased directly on our Li-Ning Badminton Superstore web site and don’t forget we offer free shipping to the USA and Canada on qualifying orders of $150 or more!